In former times the Hatto in a Zemple was where the master delivered his sermons, teaching the Buddha Dharma to the assembled monks. In present times it is used primarily for important ceremonial functions. Tenryu-ji's Hatto, like most of the temple's major buildings, was destroyed by fire in 1864 during the fighting that preceded the fall of the Tokugawa Shogunate. Following the Meiji Restoration in 1868, Tenryu-ji's large Zendo (Meditation Hall) was relocated from Yu'un-an to serve as a replacement. The large plaque above the hall's front entrance, which reads “Senbutsujo” (a synonym for “Zen Meditation Hall”), serves as a reminder of the hall's previous function. In 1899 the Hatto's paneled ceiling was adorned with a large painting of a cloud dragon by the Meiji-period artist Suzuki Shonen. This was replaced in 1997 with a new cloud dragon painting by the renowned nihonga artist Kayama Matazo, as part of a large-scale renovation of the Hatto commemorating the 650th anniversary of the death of Tenryu-ji's founder, Muso Soseki. On the altar inside the Dharma Hall are images of Shakyamuni Buddha and his two chief bodhisattva disciples, Manjusri and Samantabhadra. On the altars at the back of the building are statues of Muso Soseki (the founding priest of Tenryu-ji) and the shogun Ashikaga Takauji (the founding patron), along with memorial tablets honoring the memory of Emperor Kogon and the successive abbots of Tenryu-ji. The Kuri is one of the major buildings traditionally counted among the “seven halls” (shichido garan) that constitute the ideal Zen monastic compound. Tenryu-ji's Kuri, constructed in 1899 and renovated in 2013, presently houses the temple's main kitchen and administrative offices. With its high, gently curving gable roof framing a half-timbered, white-plastered facade, the Kuri is the most commonly photographed of Tenryu-ji's buildings and has become something of a symbol for the temple itself. Inside the Kuri's entrance hall is a large painting of Bodhidharma, the Indian monk who, according to Zen tradition, transmitted the Zen teachings to China 1,500 years ago. The painting was done by the late Rev. 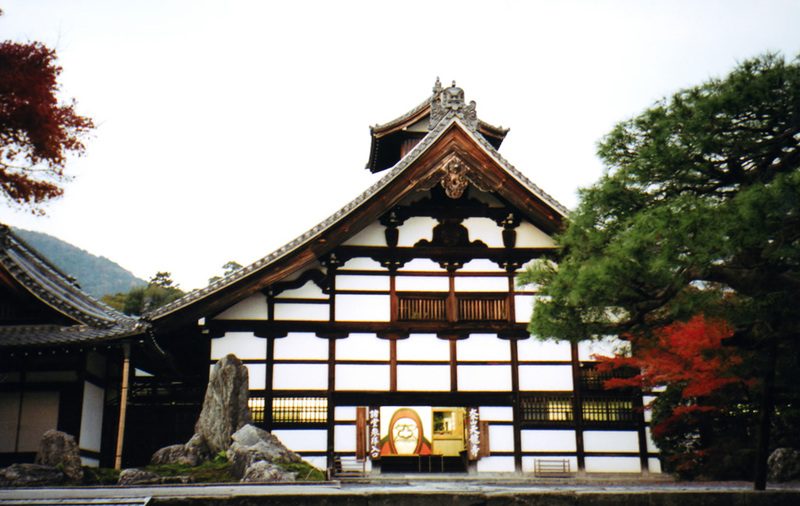 Hirata Seiko, Chief Abbot of Tenryu-ji, and is similar to one found in the alcove (tokonoma) of the Hojo (Abbot's Quarters). This style of Bodhidharma painting is seldom seen outside of Tenryu-ji, and in this sense represents a kind of “face” for the temple. The Hojo is made up of two sections, the Daihojo (Large Hojo) and the separate Kohojo (Small Hojo), both of which are connected to the Kuri. The Daihojo, which is used primarily for ceremonial functions and other large events, was completed in 1899, and the Kohojo in 1924. The Daihojo, Tenryu-ji's largest building, has wide verandas on its front (facing the Middle Gate to the east) and back (facing the Sogen Pond to the west), and a narrower outer veranda surrounding the entire structure. The calligraphy reading 方丈 (Hojo) on the large plaque above the Daihojo's front entrance is the work of Rev. Seki Bokuo (1903-1991), a former abbot of Tenryu-ji. The Buddha image enshrined on the altar is that of Shakyamuni Buddha, and is registered as an Important Cultural Property. 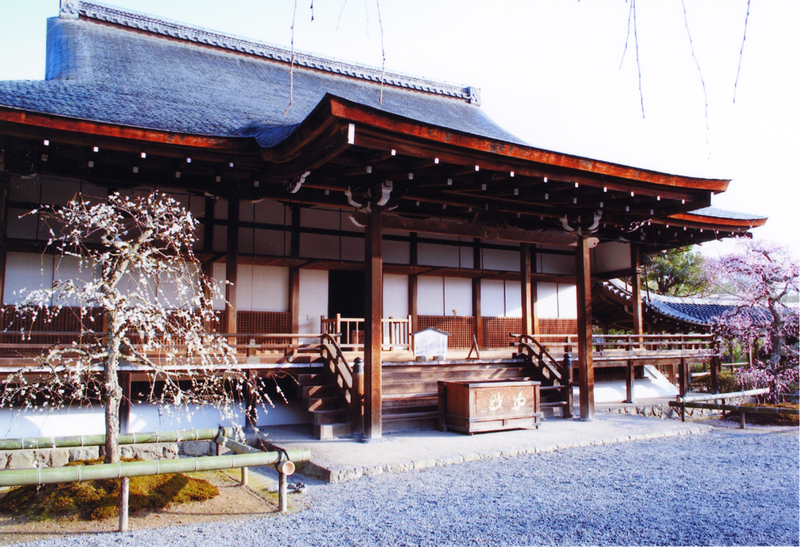 It is believed to date back to the late Heian period (794-1185), and is thus far older than Tenryu-ji itself. Having escaped damage in all eight of Tenryu-ji's major fires, it is the most ancient of all the temple's Buddha images. 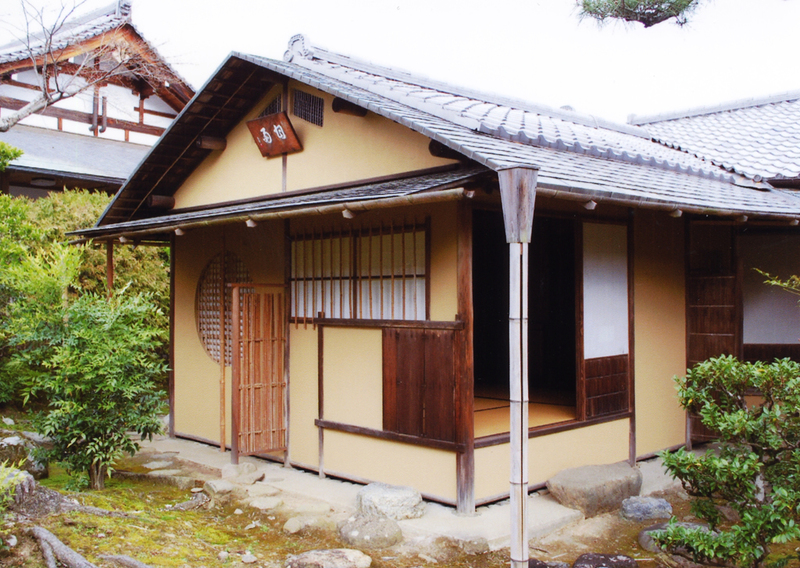 The inside of the Daihojo is partitioned into six sections in the traditiona Hojo architectural style, with three sections in the front and three to the rear. The front-central section, with the Shakyamuni image in the back, covers an area of 48 tatami mats, while the sections to either side cover an area of 24 tatami mats each. These sections can be used together as a single room, or partitioned into three separate spaces using sliding doors.. The large cloud dragon on the sliding doors facing the Sogen Pond was painted by the artist Wakasa Butsugai. Wakasa was born in 1887 in Akita Prefecture and studied art at the Tokyo Geijutsu Gakko. Following graduation he first became the disciple of Yamamoto Shunkyo (1872-1933), then of Yamada Kaido (1870-1924), a successor to the great nihonga artist Tomioka Tessai (1837-1924). Wakasa, a friend of the former Chief Abbot Seki Bokuo, painted the cloud dragon in 1957, just four months prior to his death. The Kohojo serves as Tenryu-ji's guest reception area. The various rooms in the building are used for greeting visitors, meetings, and a variety of other functions. 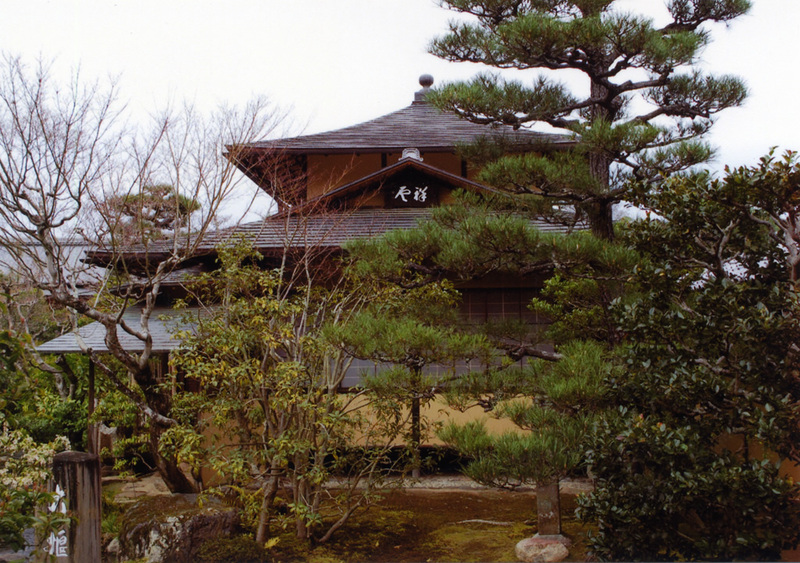 The Ryumontei is the home of Shigetsu, Tenryu-ji's Zen vegetarian restaurant. Located just to the south of the Sogen Pond, it was built on the site of the former Ryumontei, one of the ten spots on Tenryu-ji's grounds identified by Muso Soseki as of special scenic beauty. The present building was completed in the year 2000 as one of the projects commemorating the 650th anniversary of Muso's death. Yu'un-an is the complex of buildings just east of the Ryumontei, with the Seiko-kan on its southwest flank. This served as Tenryu-ji's training monastery until the early 1990s, when a new monastery in the quieter northern precincts of the temple was built. Yu'un-an is presently used for lectures, meetings, and various workshops and programs. Tenryu-ji's monthly zazenkai (Zen meditation gathering) also takes place at Yu'un-an. Held on the second Sunday of the month and featuring an hour of meditation followed by a Zen lecture by Chief Abbot Sasaki Yodo, the zazenkai begins at 9:00am and is open to the public; admission is free and no reservation is necessary. Laid out nearly seven hundred years ago by Zen master Muso Soseki and still retaining its original appearance, the Sogenchi Garden was the first place in the country to win designation by the Japanese Government as a Site of Special Historic and Scenic Importance (Shiseki, Tokubetsu Meisho). It is designed as a strolling pond garden, in which a level path surrounding a picturesque pond allows guests to appreciate the scenery from a variety of perspectives. The Sogenchi Garden also employs “borrowed scenery” (shakkei), in which nearby mountains are used to give the garden a sense of added depth. 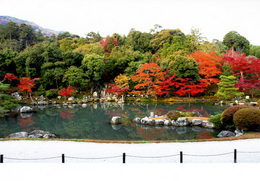 The garden is included in the Miyako Rinsen Meisho Zue (Illustrated Guide to the Famous Gardens and Scenic spots in the Capital), an early sightseeing guide to the sights of Kyoto published in 1799. The accompanying woodblock print shows that the garden's appearance has remained substantially unchanged in the centuries since then. 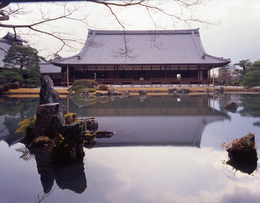 Looking directly across the pond from the center of the Hojo's veranda, the visitor can see an arrangement of several large standing rocks. These represent the Dragon Gate Falls, a waterfall on the Yellow River in China. Chinese legend has it that any carp able to scale these falls turns into a dragon, a transformation that in Zen has come to symbolize enlightenment. A number of Zen gardens feature similar stone arrangements, generally with a number of smaller “carp stones” placed at the foot of the falls. However, the Sogenchi Garden is unusual in that the carp stone is placed to the side of the falls, to show a fish in the process of turning into a dragon. The pond received the name Sogenchi when Muso Soseki, while removing mud to deepen the water, discovered a stone stele inscribed with the characters for “Sogen itteki.” The expression “Sogen itteki” refers to the living truth of Zen that, like a steady trickle of water, has continued through the centuries to the present day. 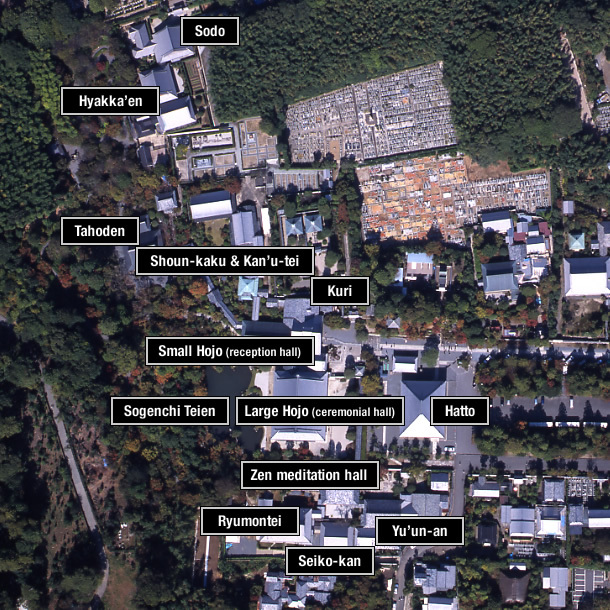 The Shoun-kaku and Kan'u-tei are teahouses located to the right of the path leading from the Kohojo to the Tahoden. The Shoun-kaku is a reproduction of the famous teahouse Zangetsu-tei (Dawn-Moon Pavilion), located at the headquarters of the Omotesenke tea family in Kyoto. 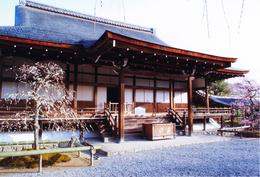 The building has a twelve-mat hiroma tea-ceremony room and a two-mat jodan no ma serving as an alcove. The Zengetsu-tei was originally constructed at Juraku-yashiki by Sen no Rikyu, the founder of the modern tea ceremony. It is one of the most highly regarded of the teahouses associated with the Omotesenke. The Kan'u-tei is a four-and-a-half mat tearoom. A special feature is the presence of triangular shingles in front of the entrance. The Shoun-kaku and Kan'u-tei teahouses were built in 1934 by the chief abbot Seki Seisetsu (1877-1945) to commemorate the reconstruction of the Tahoden. The Tahoden is located at the end of the long, covered corridor that winds up the slope from the northwest corner of the Kohojo past the Shoun-kaku and Kan'u-tei teahouses to the right. 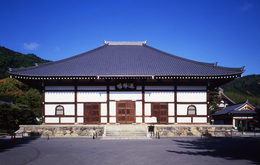 The Tahoden comprises a worship hall in the front, a shrine displaying a statue of Emperor Go-Daigo in the rear, and an intermediate room connecting the two. At the front of the building a pent roof covers a staircase leading up to a wide veranda. The Tahoden's elegant hip-and-gable roof brings to mind the medieval residence of an aristocratic family. The Tahoden is located on the site where Emperor Go-Daigo (1288-1339) studied when he was still a prince living with his grandfather Emperor Kameyama (1249-1305). 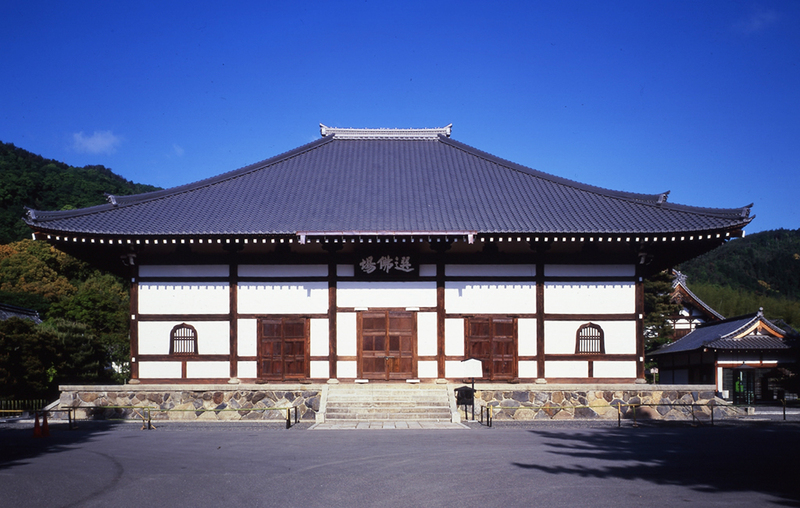 The present building was built in 1934 by Chief Abbot Seki Seisetsu. It follows what is believed to be the design of the Shishinden (Hall for State Ceremonies) at Emperor Go-Daigo's Southern Court in the mountains of Yoshino. The emperor's statue in the Tahoden is flanked on both sides by the mortuary tablets of the successive generations of emperors. To the north of the Tahoden on the path to the North Gate is the Hyakka'en, a garden of flowering trees, bushes, and herbs laid out simultaneously with the construction of the North Gate in 1983. The garden path rises up the gentle slope of the hill toward the road along the north boundary of Tenryu-ji, on which the visitor, once leaving the gate, may walk through the famous Sagano bamboo forest. The road also leads to the Okochi Sanso Villa, Jojakko-ji, Rakushisha, and other sightseeing destinations. The Sodo (which is closed to the public) is the training hall offering a communal life of work, meditation, and mendicancy for those preparing to become Zen priests or Zen masters. The Seiko-kan, built in the year 2000 as one of the projects commemorating the 650th anniversary of Muso's death, is the home of the Tenryu-ji Historiographical Institute (formerly named the Tenryu-ji Institute for Philosophy and Religion). The Institute has a large collection of books and journals in the areas of philosophy and religion. Among the works sponsored by the Institute are Entangling Vines (a translation of the koan collection Shumon Kattoshu) and Dialogues in a Dream (a translation of Muso Soseki's Muchu Mondo).